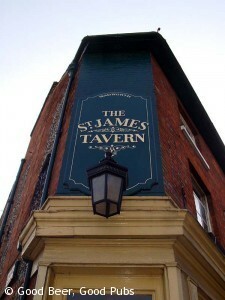 The St James Tavern is at the eastern end of Romsey Road, close to Winchester station and the West Gate of the city. The pub is a bit like a tardis – it looks tiny from the outside but actually is much bigger inside. The interior is wooden and traditional, but with modern touches. The current owners have given the pub an interesting feel with the inclusion of many curios and games. In the 20 or so years that I’ve known it the St James Tavern has always featured Wadworth’s beers, and the 5 hand pumps serve a good selection – including one guest (Adnams Broadside) on my last visit. The beers all taste well-kept. A good selection of wines is available too. The pub serves lunches every day and evening meals Monday to Saturday. Roast dinners are available on Sunday. I recently had a burger here which was very good. There’s a small courtyard garden out the back which amazingly used to be the car park (see it on the photos page). There is a quiz night every Tuesday at the St James Tavern and live acoustic music on Sunday afternoons.